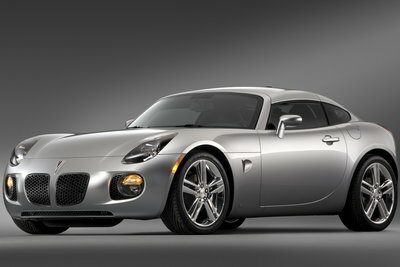 When Pontiac debuted the Solstice to the public in 2002, there were two versions, a roadster and a coupe. For many, the small rear-wheel-drive coupe was the more intriguing of the two vehicles. Seven years later the coupe is finally seeing the light of day. The production coupe model features a fixed rear hatch with a removable roof section over the occupants similar to a Lotus. Like the roadster, Pontiac offers the coupe with two engines. A 177-bhp 2.4L four-cylinder powers base models, whereas the GXP performance model features a 2.0L turbocharged four-cylinder rated at 260-bhp. Both engines can be fitted with either five-speed manual or automatic transmissions. The coupe addresses the one major fault of the Solstice, which is the clunky roof mechanism. For this reason, the coupe may be the more compelling of the two vehicles. The Solstice coupe is a new model featuring a fixed hatchback with a removable roof section over the occupants. Powertrain options mirror those of the roadster. A 177-bhp 2.4L four-cylinder powers base models, whereas the GXP performance model features a 2.0L turbocharged four-cylinder rated at 260-bhp. Both engines can be fitted with either five-speed manual or automatic transmissions.